At PEM Surface Creations, we are always hard at work developing new applications for our slip-resistant matting. While our flooring currently blankets a wide array of industries including golf courses and aquatic facilities, there are several industries out there that could be benefiting from our slip-resistant flooring. What are we currently thinking about? Three words: triathlon transition mats. All participants in a triathlon must compete in three main phases: swimming, biking and running. When the triathlete is changing from water to land, they must first go through what is called a triathlon transition area. While in this zone, which is normally a few hundred meters, the tri-athlete must walk or run alongside their bike. Typically, the area of the transition area is covered in either plywood or wet towels, presenting a slippery surface for both the triathlete and triathlon workers. Also, because the triathlete is coming straight out of the water, their bare feet are normally covered in sand or mud. As the muck is tracked onto the surface of the transition area, two potential hazards are formed: slippage and cuts to the feet. Once event organizers begin to hose down the feet of the triathletes the area can become very slick, leaving the least experienced participants at the greatest risk of injury. In lieu of overly saturated carpet or plywood, we suggest installing some of our PEM high traffic slip-resistant matting. Because our matting is permeable in nature, it allows for water to drain through the surface, reducing the risk of puddles forming. In addition, our textured surface would provide superior comfort to the athletes’ bare feet. Below you will find a side-by-side comparison of the standard surface and our PEM slip-resistant matting. 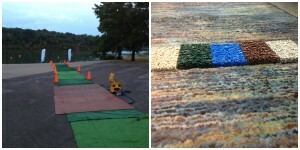 As you can see, PEM matting would be a welcome addition to any triathlon transition area. Its superior aesthetics allows our matting to blend into any setting—regardless of race’s theme. If you would like to learn more about triathlon transition matting, please feel free to fill out our contact form or give us a call at 800.783.2358.